I started this hashtag on twitter for people to talk about all the ways in which they are so much more than just their mental illness. Watching the responses pour in has been amazing and heartbreaking and I just have so much love for everyone brave enough to tweet about such a stigmatized issue. I genuinely only seldom feel as though I am #notmymentalillness but I wanna affirm my solidarity with everyone in the struggle anyway! Love! An astute, erudite student, inquisitor, cook, daughter, adoptee, lover, aunty & friend. Am empathetic, warm, ruthless. #notmymentalillness. I just feel like the mental illness is all there is now. The person I was is gone. I’m what’s left. And what’s left is a repugnant, useless failure. There is no reason for me to be alive. There are always reasons to stay alive! If for nothing else, for the sake of the people who love you. I know it’s hard. It was almost impossible for me to cope before my therapist and antidepressants. All I can say is, you are not alone. Millions of us share your pain and millions of us want you to stay alive, for all our sakes. Your living gives me the courage to live too. Well, thanks to you, and to Jollyblog, for the words of encouragement, but I’m afraid they don’t connect or have any relevance to me. I’m aware I have to stay alive to avoid inflicting pain on others, but a reason not to kill yourself is not a reason to be alive; rather it amplifies the emptiness of my life on a daily, hourly, moment by moment basis. It would have been far better if I had never been born. Instead I have to live this groundhog day again and again in which I manage to regularly confirm how devoid of meaning my life is, what a failure I am at everything, that I do not belong among normal people. The helplines you mention are for people who want help not to kill themselves; as that prospect holds no fear for me I’d much rather have a conversation about the effective mechanics of suicide. I have a canister of helium but I’m not sure what to do with it. Anyway. Thanks again. Hope you find the things you’re looking for in life. Such a great idea for you to start this Twitter hashtag. I think communicating about mental illness and showing that it’s healthy and powerful to talk about it will help with erasing the stigma. Among the things I wish I’d thought of is this campaign. 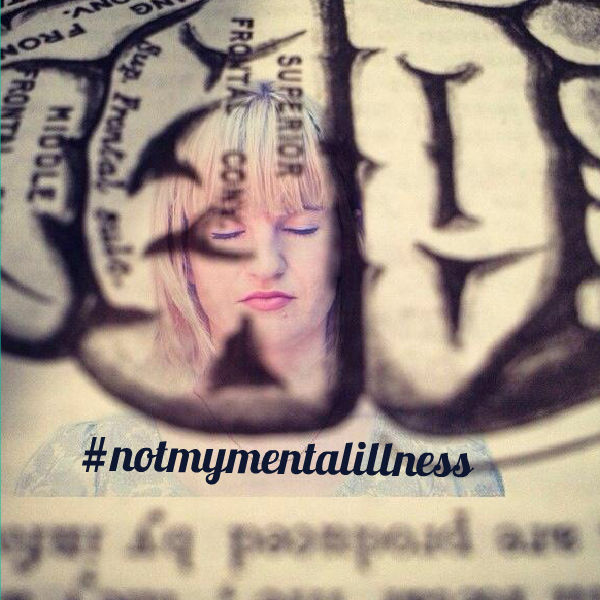 The Belle Jar started the hashtag #notmymentalillness and it’s encouraging those of us with neurodiversities to tweet about not being defined by our mental illness. Get on it! Thank-you for this hashtag. I say AMEN to that! We are not what we experience but so much more! Again, thank-you. Ann, you’re cageless, and I love you for that. I do.